Updated: Asteroid YU55 “Puzzling Structures”: Equatorial Ridge and Tall, “Pointy” Hill? “There is a rather sharp, little pointy - hill? 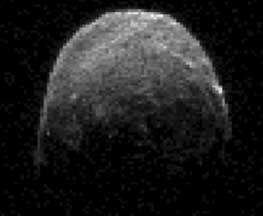 NASA Jet Propulsion Lab, Pasadena, Calif.
Asteroid 2005 YU55 radar image of asteroid was obtained on November 7, 2011, at 11:45 AM PST when the space rock was at 3.6 lunar distances, about 860,000 miles (1.38 million km), from Earth. The next day November 8, at 3:28 PM Pacific, YU55 moved closest to the Earth at 30,000 mph, 201,700 miles from Earth measured from the center of our planet. Radar image credit: NASA/JPL-Caltech. See NASA Nov. 7 brief video of radar images in websites below. Next PostNext Part 3: More Multi-Colored Aerial “Symbols” Above Kitchener, Ontario, Canada.